The new Xstrata Process Support (XPS) minerals crushing and blending pilot plant in Sudbury, Ontario, Canada, converts a wide range of ores into samples for process testing. It is significantly larger, more productive, more easily cleaned, and more automated than prior manually operated laboratory scale facilities. The unit crushes and screens up to 150 kg/h (330 lb/h) of ore, compared with about 100 kg/d (220 lb/d) for the company’s former manually operated facility. “As far as we know, there is nothing else like it,” said XPS metallurgist and project manager David Middleditch. XPS’s combination of large-scale equipment and automated conveying and screening equipment increases production, improves plant safety and ensures test sample integrity. The company also designed the plant for superior cleanability. In the past, said Middleditch, laboratories used small-scale equipment because it was easier to clean to avoid cross-contamination between product runs. 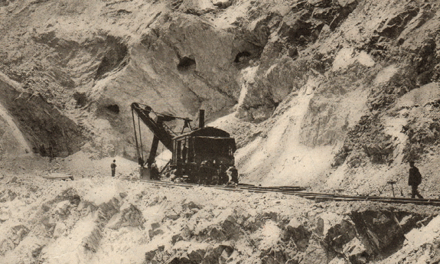 XPS opted for larger equipment, but can still clean the entire line in only three or four hours.A new double-deck, circular vibratory screener plays a key role in automating the flow of material through the facility by separating on-size crushed ore having maximum particle sizes down to 1.7 mm (10 mesh) from oversized fragments that require further processing. The screener disassembles rapidly for thorough cleaning, to prevent cross contamination between batches. The new crushing and blending plant is one of several lab-scale testwork units at XPS. The Sudbury facility also contains pilot equipment to test flotation, extraction and smelting strategies as well as laboratory devices to analyze mineral compositions and modal mineralogy. XPS once provided these services solely for its corporate parent, Xstrata plc, a major producer of copper, nickel, coal, and other commodity materials. XPS now operates as an independent subsidiary, providing technical services to the wider minerals processing industry. XPS’s Process Mineralogy group evaluates samples from mineral discoveries to assess composition, physical properties, ore chemistry and response to extraction methods. This determines profit potential. Although assays offer clues to processing strategies, every discovery has unique mineralogy. Before spending tens or even hundreds of millions of dollars on new extraction facilities, companies test ore samples at laboratory and pilot plant scale to optimize their processes. XPS Process Mineralogy’s new crushing and blending pilot plant provides the replicate sample charges for those tests. Sample requirements range from 50 kg (110 lb) of material for laboratory testing to 10 metric tons (12 tons) or more for an extensive development program. Mineralogy may vary significantly within a single mineral discovery. Geologists capture those differences by drilling for samples at different sites. XPS then crushes the drill core samples to a size determined by the testwork program, screens, blends and splits the material into homogenous samples that represent the mineralogy of the deposit or resource. This approach is also applied to distinct zones or variability samples within the resource. In the past, XPS produced samples manually. “Someone would feed the ore into the crusher, then take the crushed ore in a pail and dump it into our original 40 in. (102 cm) diameter single deck screener. The fines would go into a pail and the oversize would go back into the crusher. We would keep going until all the material had been crushed down to the specified product size. “Producing a 100-kg (220-lb) charge would take a worker a full day. One metric ton would require two full-time employees to work for two weeks. We then had to blend all of the screened material to ensure uniformity of each production run to ensure that all charges are homogenous,” said Middleditch. The automated line turns those days into hours, reducing the time needed to prepare a 200-kg sample from 2 days to 3-4 hours, and producing tons of samples in weeks rather than months. The process begins with a remotely controlled platform that hoists pails of ore and dumps them into a hopper. The hopper feeds the ore into an 8 x 10-in. (10 x 25-cm) primary jaw crusher that handles ore fragments up to 6 in. (15 cm) in diameter. Crushed ore is conveyed to the new 30-in. (76-cm) double-deck screener, a standard Vibroscreen separator from Kason Corp., and sifted first by the upper deck. This large-aperture, heavy-duty upper “scalping” screen of stainless steel wire removes the largest, most abrasive fragments, thereby protecting the finer-mesh lower screen from damage while contributing significantly to the machine’s capacity. Material passing through the upper screen falls onto the lower screen, which removes all particles greater than the aperture size of any given screen installed. XPS can change both screens to meet customer requirements. It typically uses a 4.5-mm (4-mesh) upper scalping screen and a 1.7-mm (10-mesh) lower cut screen. Some customers prefer different sizes. “We work with one client who specifies a 6-mm (3-mesh) cut screen and another who specifies a 3.5-mm (6-mesh). We’ll do whatever the customer requires,” said Middleditch. Oversize particles exit both screens at their peripheries through discharge spouts, and are transported back the crusher for pulverizing, while on-size particles are loaded into drums awaiting blending. Fabricated of 304 stainless steel, the screener is able to withstand constant vibration of abrasive particles. Vibration induced by a 1-hp (746-W) imbalanced-weight gyratory motor mounted directly beneath the screening chamber promotes rapid passage of on-size particles through apertures in the screen, while moving oversize particles along a predefined path to the discharge chute at each screen’s periphery. “The circular screener handles as much as we can throw at it, and could probably handle the additional volume if we expanded the plant,” said Middleditch. A conveyor system receives the fines from the circular screener. A conveyor removes oversized material so it can be re-crushed, sifted, combined with the fines from the first screening, and placed in drums. The drums are blended in one of two new high-efficiency, high-volume blenders capable of mixing multiple drums in a single operation, significantly reducing blending time when compared with the smaller blenders Xstrata operated in the past. Barrels of blended material are then discharged into two spinning rifflers, which divide the samples into smaller representative and replicate batches. The mixing and riffling process is so consistent, it produces test charges with relative standard deviations less than 2-5% in their base metal content. While screening performance is vital, so is cleanability. “We run one batch after another through the unit and we cannot tolerate any cross-contamination,” said Middleditch. In fact, he noted that cleaning is one of the reasons XPS stayed with smaller pilot plant equipment. “Smaller equipment was easier to clean to eliminate contamination after a run,” he explained. XPS designed the plant so workers could clean it completely in three to four hours. The Kason screener is among the fastest machines to clean, according to Middleditch. “Just undo a few clamps, take out the screen and vacuum the top,” he said. This gives workers more time to spend on harder-to-clean equipment such as crushers and blenders. The new circular screener’s ability to rapidly sort conveyed material fits right into XPS’s first-of-its-kind crushing and blending plant. Information for this article was provided by Kason Corp. (www.kason.com), a Millburn, New Jersey, USA-based manufacturer of vibratory, centrifugal, and static screening equipment for solids/solids and liquid/solids separations. In a bid to familiarize future metallurgists and engineers with its process equipment products, Metso said it recently donated a significant quantity of equipment and services to the University of Mines and Technology (UMaT) in Tarkwa, Ghana. The equipment, valued at $50,000, included a Metso D12 flotation cell/scrubber; a Morse Model 2000 4 X 6-in. jaw crusher; a Marcy 6-in. Gyroll cone crusher; a Denver vacuum filter; several Marcy pulp density scales; a Denver pulp density scale; a Denver 4 X 6-in. mineral jig; plus spare parts and operating manuals. With the exception of the mineral jig, which had been discontinued, all of the equipment is brand new and currently part of Metso’s product portfolio. A service agreement will also be entered into by the two parties. The donation also included 50 copies of mineral processing textbooks. In addition, Metso said it plans to initiate an annual award which consists of a cash price donation to the school’s best mining and mineral engineering student starting from this year’s class; and an annual “mining school” to train and update the students about technological developments in the mining industry.